Tracking of Annual Leave can get pretty messy with repeated increments, rollover of balance and proration. But when your settings are correct, the system turns it hassle-free. 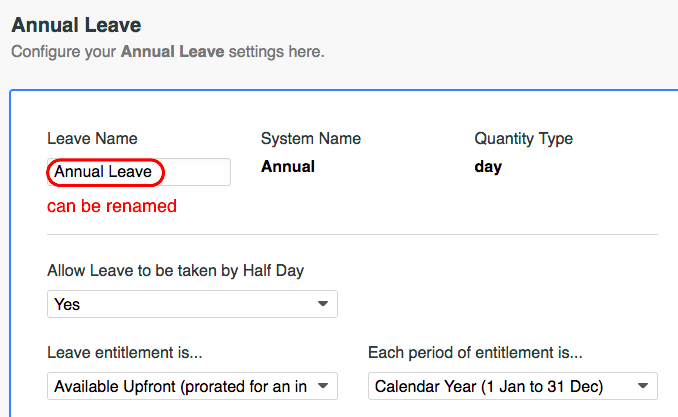 To configure the default Annual Leave settings for the whole company, head to Leave => Settings => Leave Types => Annual Leave. Annual Leave can be renamed if you like. Taking of half a day of leave is typically practised. - all N days per year can be taken immediately. - entitlement for the year is prorated by the number of complete months/days in a year according to Hire/Resign date. - allows staff the most flexibility when planning leave each year. Overconsumption of leave before resignation will display a negative balance. - N days per year is accumulated in parts. - additional leave is earned on the last day of each complete month. - this prevents staff from over-consuming leave but restricts longer holidays to the year end. - entitlement replenishes on 1 Jan, for the period up to 31 Dec, annually. - preferred for easier comparison of individual balance closer to the year end. - entitlement replenishes on the anniversary date of hire per person. - entitlement replenishes on the anniversary date of a custom date. after a fixed probation period e.g. 3 months. on confirmation date (when it's entered at the employee's profile) . after a fixed period or when a confirmation date entered is earlier than the end of the probation period. While this affects application of leave, entitlement is always calculated from hire date. Note that update of the confirmation date field at the employee's profile does not affect when the leave can be applied. Unused leave can either be forfeited at the end of each entitlement period or rolled over to the next period by N months, up to a year (an option for perpetual rollover is upcoming). The rollover amount can be limited to N days or by percentage of the yearly entitlement. or it can increase with years of service. Feel free to delete or add rows (award schedules) as necessary. Employees need to be assigned to the selected leave grade else they will respect the settings under Leave Types => Annual Leave. Tip: employees can be assigned to a leave grade with entitlement quantity 0, if they are not entitled to Annual Leave.